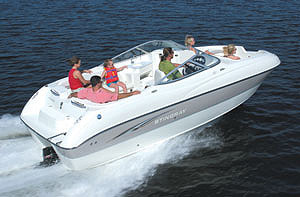 Stingray 240LR impresses with features, speed and a smooth ride. The 240LR rides smoothly over rough chop. 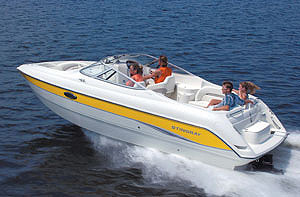 Anyone looking for a fast and feature-laden large runabout would do well to visit their local Stingray dealer for a gander at the 2003 Stingray 240LR. Here's a 24-foot boat that impresses with amenities and performance that will please the most discriminating boating enthusiast. We had an occasion to spend time with the 240LR on a dark and stormy day in Southern Alabama. With skies clouded by storms producing tornados to our north, we set out to run the 240LR through its paces in Orange Beach, Alabama. First impressions count a lot when reviewing a boat, and that was the case here, as well. 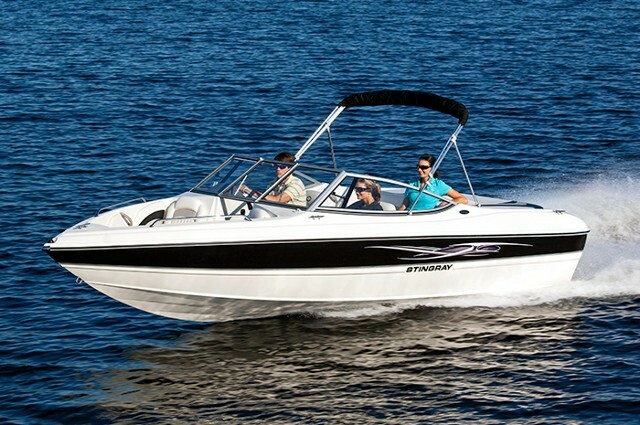 The Stingray 240LR is sleekly styled, with a deep cockpit and the flowing design of the interior made this already large boat feel roomier than others. The 240LR's stern is a large swim platform complete with a built-in step that frames a built-in storage bin. Just inboard of the transom is full-width seat with a center cushion that can be removed to reveal a step area with a slip-resistant surface. The step provides an easy way to get on board from the stern without having to walk on the cushions. Once you're on board, there's room to move easily about the boat. A large engine cover and hatches on the deck on both the port and starboard sides of the engine bay allow easy access for service. While access to the boat's guts is excellent, we would recommend that Stingray place the battery a bit farther forward, as it is a reach at its current location. The built-in cooler just behind the captain's chair is drained, and it features a lid that has space to set an optional stove when flipped upside down. To port, a portable 25-quart cooler has its own space designed to keep it from moving. Seating is plentiful forward and aft, with a wrap-around bench along the stern and sculpted lounges in the bow that have comfortable forward-facing cushions. At the control console, dark woodgrain trim outlines a full array of gauges that wrap around the console, and custom molded seats provide plenty of comfort. The freshwater sink on the port side of the main cabin is pressurized, with its own electric pump. When not in use, the boat's standard table stores belowdecks, inside the starboard rear hatch near the engine. Although the 240LR is an open-bow boat, its designers included a roomy head compartment just in front of the port passenger seat, under the windshield. The compartment includes a portable head, a light and a window. A large storage area for gear is located on the opposite side of the walk-through, forward of the control console. This area allows access for servicing everything on the console. 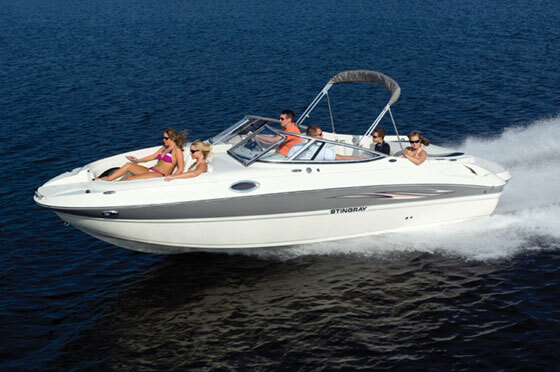 Our test boat was powered by a smooth-running Mercury MerCruiser Bravo I 5.7L stern drive. With 300 hp on tap, the MerCruiser moved this large runabout with authority. Standard power steering made controlling the 240LR a breeze, though we felt the throttle was a bit notchy going out of neutral. However, we won't hold this against Stingray; it may have been the result of the boat just coming out of the factory. Water conditions at Orange Beach were ideal for our tests, choppy and windblown from the thunderstorms to our north. It gave us a good opportunity to see how the 240LR rode the waves. We can tell you it did just fine, thank you. The boat's high freeboard means passengers ride deep inside, protected from splashes and wind. The deep freeboard will particularly appeal to young passengers nervous about being on the water. The 240LR rides smoothly over rough chop, and the hull slices through larger waves like a Ginsu knife through a tomato. 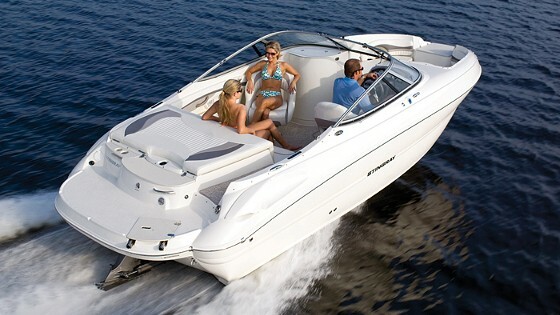 The boat steers crisply with good control. 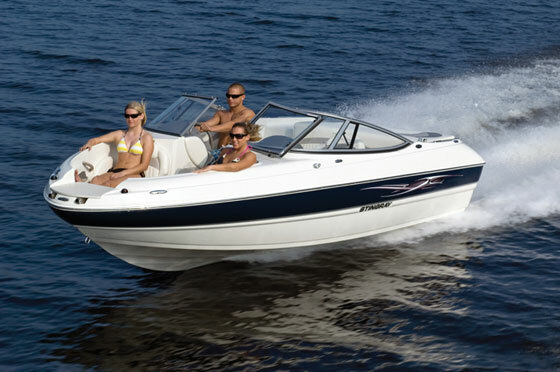 Acceleration is swift, but we felt that a dual prop setup from the MerCruiser Bravo III would be a benefit here. Pushing the throttle forward brings about an initial rush as the bow rises slightly; then the boat takes off like a scalded dog. With the throttle maxed out, we saw just over 50 mph. The factory says the 240LR can reach 55 mph, and we think it can, with a bit of fine-tuning at the dealer. 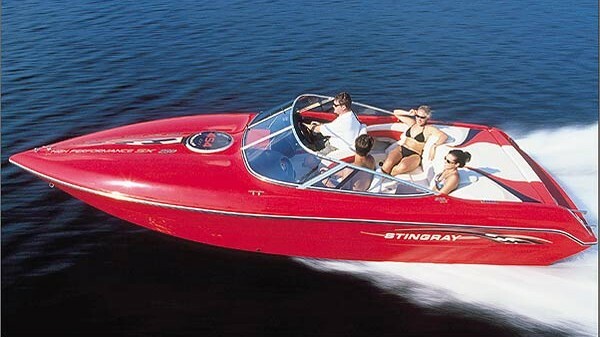 Then, there is Stingray's patented Z-Plane hull, which is up to 30 percent more efficient than other hull designs. The hull has a racing derived notched transom, which lowers drag, improves fuel efficiency and provides a higher top speed. 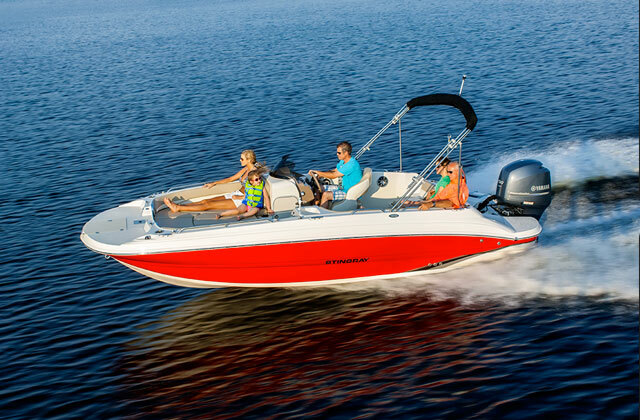 Options include such things as cockpit and bow covers, a remote tilt and trim switch, an upgraded 19-inch Lazer SS propeller, a built-in digital depth finder and snap-in carpet. Out tester was equipped with the remote trim tilt switch, and we think most owners who trailer their boat would want that option for the convenience it offers. Stingray officials say their 240LR is targeted for families looking to step up into a larger bowrider after owning an 18- or 19-footer. 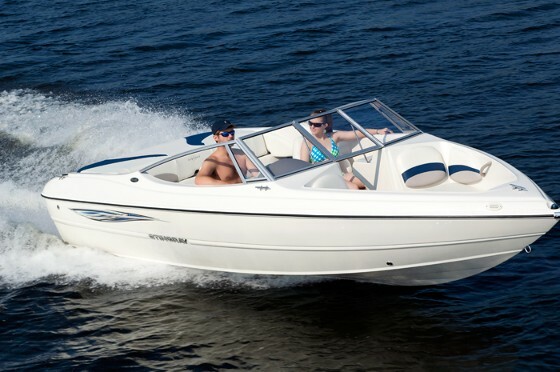 With all the standard features, style and performance, the Stingray 240LR is a very good value and would make an excellent choice for those looking for such a boat. While our 240LR stickered at $43,055, significant dealer incentives are available and can save you several thousand dollars. To most people, luxury is often associated with size and features. The Stingray 240LR meets the luxury definition with ease, and is a boat that will provide most families with years of fun on the water. Bimini top and boot, pressurized water w/transom shower, windshield side vents, Dino steering wheel, 25-quart removable cooler, cockpit table, Kenwood high-power CD player w/remote, magnetic compass, indirect cockpit lighting, freshwater sink, Porta-potty w/self-contained holding tank, remote oil change system, power steering, stainless steel fittings. Snap-in carpet ($412), digital depth finder w/depth alarm ($304), portable head w/tank and dockside pumpout ($283), automatic fire extinguishing system ($585), remote trim and tilt switch ($106), full canvas set ($942), two-tone hull color stripe ($385).